A Guardian article by Ed Vulliammy (How Trump’s presidency has divided Jewish America, Nov. 14) highlights the views of Jonathan Weisman, a New York Times journalist and author of a book on the American Jewish community. “On the right,” writes Weisman, “anti-Semitism and militant Zionism can co-exist quite comfortably.” [Richard] Spencer calls his movement a “sort of white Zionism”. In a New York Times podcast, Weisman even posits that recent racial policies by the Netanyahu government have made Israel a “model” for the alt-right on how to construct an “ethno-state”. We listened to the NY Times podcast the author is almost certainly referring to, and Weisman never makes anything resembling the claim that Netanyahu’s “racial policies” have made Israel a “model” for the alt-right on how to construct an “ethno-state”. Upon researching the words attributed to Weisman, it appears as if it’s at least possible the author was conflating the NY Times podcast with an interview Weisman did with Alternet, in which case he still got it wrong. As you can see, Weisman is merely characterising how some on the alt-right view Israel. He isn’t asserting, in his own voice, that the “racial policies” of Israel’s government have made the state a model for the alt-right, as the author claims. Note that this isn’t the first time a Guardian contributor attempted to associate Israel with the white nationalism of the alt-right. 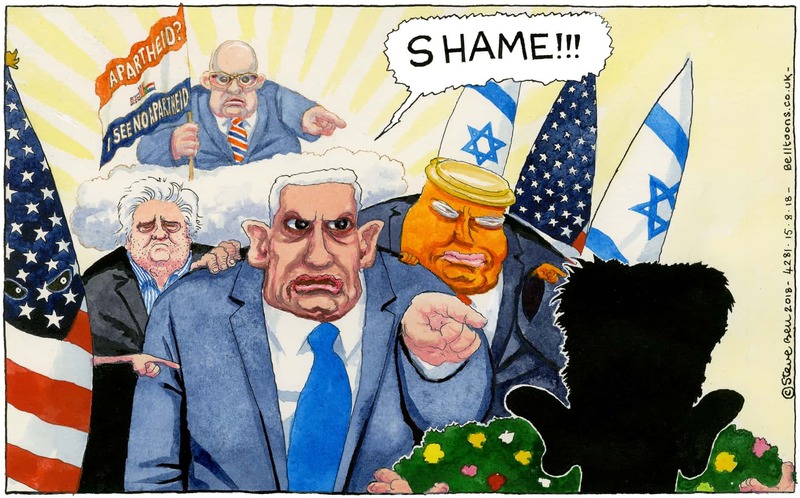 Back in August, we posted about a truly vile cartoon by Steve Bell which suggested that Zionism was a racist ideology, akin to apartheid and white supremacy. We’ve reached out to Weisman in an attempt to find out with certainty if he’s ever made such a comparison. We also tweeted the journalist and complained to Guardian editors. However, among all the media outlets we monitor, Guardian editors are the most unresponsive to our complaints. So, unsurprisingly, we haven’t received a reply. You haven’t received a reply because it’s hard for them to come up with a defense because it’s hard to defend, and they know it. The Guardian is a vile sewer. That’s all there is to it. Isn’t Guardian English for Der Stürmer? There should be a cartoon of Julius Streicher of the infamous Der Sturmer giving thumbs up, Atta Boy’s, congratulatory floral arrangements to Der Guardian for continuing Der Sturmer’s editorial policies. Fascist Steve Bell can go to Hell. Why isn’t there a concerted campaign to demand that companies that advertise in Der Guardian cease doing so??? Got to add this Data Point. In London, the most popular name for a new born baby boy is…………………. When you’re that far left everything else looks alt-right. And besides, the Guardian is going to resist with all their might admitting to such errors as long as their boy Corbyn is so close to taking power they can taste it. At this point any and all lies are permissible for the cause. This ought to give you a clue of what the Guardian will be like if Corbyn does become Ayatollah.